Heals nearby allies by 100% ATK every 1 second for 6 seconds and reduces DMG taken for all heroes by 5% for 3 seconds. CHARACTER transcends media. Characters in novels and films may be flat or round, adumbrating from the terms used by E.M. Forster in Aspects of the Novel. What about characters in video games? Are they susceptible to the projections of the game player? Are they finite and created, like most literary characters? Or do game players manipulate them like puppets? How do the numerical parameters for the creation of video characters affect their role as creatures of the imagination? Since game players presumably play to win, are video characters primarily tools? The Blood Priest, above, seems to be composed of heat and steam that practically comes off of the page/ screen. The wispy lines of the drawing, suggesting power beyond the 3D world, as well as volume that represents the priest's reality, makes the idea of manipulating this character in a video game potentially very exciting. This is no 1950s Disney character. 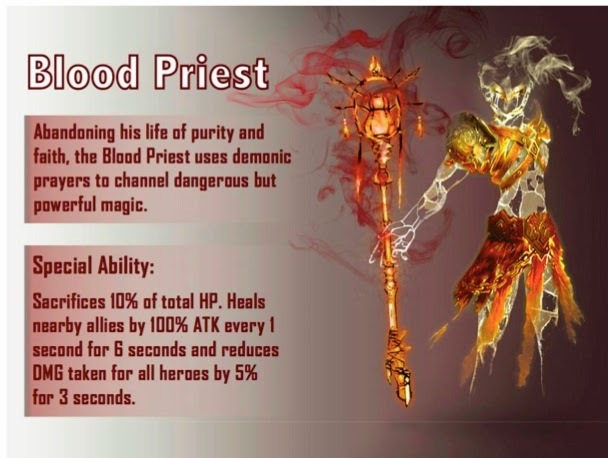 Visually, the Blood Priest seems halfway between the human and the elemental, as though his power lies close to the sources of energy: earth, water, fire, air. A wonderful, fluid, and creative design. Go, Alex! Agreed! It's fluid and dynamic–––a great character for a video game!